These are the new requirements in effect starting on August 1, 2018. To compete in level 8 gymnastics, a gymnast must be able to do the following skills on each of the four events. 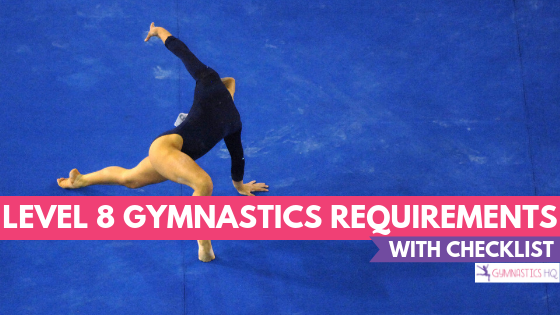 If a gymnast’s routine doesn’t have all of the requirements, deductions will be applied. In addition to the requirements below, all level 8 bars, floor and beam routines must have 4 “A” valued skills and 4 “B” valued skills. 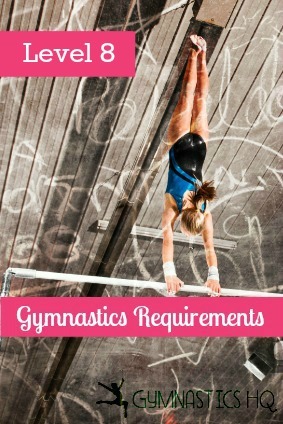 Level 8 gymnasts must perform a minimum of a front handspring vault. I live in NY and i want to start gymnastics again any ideas? Are you looking for a gym? What area of NY do you live in? I live on Long Island. Im only level 3 and i have no idea what any of this means! Amber, That is rude to say, honestly stop being full of yourself and think that maybe people are just starting or they are on the same level what is someone form level 9 said that how would you feel? Also if the 1-7 levels aren’t there they will be. So please stop keep that in your head, we don’t need your selfish comments, Thanks!!! Being twelve and level isn’t bad at all. I started at eleven and was a level 1 (recreational). Now it hasn’t been more than 3 months and I am now a rec level 3. I’m switching gyms soon and was already told that at my new gym I will be competing xcel silver. As for advice I would say you need to really practice a lot and decide what you goals are and if they’re reasonable. I mean, most of the competitive kids at levels like USAG levels 1-4 the kids are pretty young same thing with xces. l bronze-gold (but at my new gym the xcel kids are quite a bit older than the USAG kids.) Another thing I would say is when you get mental blocks you just have to go for it. I had major mental blocks when I was learning my back handspring and my back walkover on beam but eventually I got over it. Just try your best, I hope this helped! Hi!thanks for all your helpful posts. Where can I find information on skill values- like which are A,B or C skills for optional levels? I’m a level seven and I’m ten. I skipped 5 and 6. I find get this. Same I am in level 7 now. I skipped 5 because the competition score was an all-around 36.0 exactly. I am also hoping to get into level 8. Well I’m 13 and jr elite!! this helped me a lot! i found out i am a level 6 not 5. I’m a level 4 gymnast in Canada. Thanks this helped so much! I’m a level 8! Yay this helped me I know that I’m a level 2! There is no such thing as level 11 unless you mean elite, or you are just lying. Emilee– I am deleting your comment because it is not nice. Please be nice and considerate when commenting. This helped a lot! I am a USAIGC gold gymnast and I am moving gyms to compete USAG, and I really wanted to know if I would be level 8 or level 7, which I would be level 8 based off this article. Thank you! This made me learn so much. Turns out i’m kinda a level 3. Also who likes my name??? What are the upcoming changes for level 8? Can a gymnast compete level 8 after testing out of level 5 or do they need to compete 6 and 7 first? Can a gymnast compete level eight after testing out of level five or do they need to compete level six and seven first? You need to score out of L7, but L6 can be skipped. I used to do gymnastics but quit. I have been self taught over the years and want to go back. By the looks of it, it seems I would be in level 7. I am 14 years old but feel ashamed to be so old with much younger people. Anonymous – never be ashamed to pursue your dreams and goals. I am a gymnast mom and attend a lot of meets, based on the meets I attend you would not be the oldest level 7 or even level 6. Go for it! Don’t feel ashamed. I am 17 years old and I compete with kids under 10. Just know that you will improve by joining and by improving you can be put higher up with people your age. You’re still young so keep up your gymnastics! my daughter can do all levels from here and down and she is a level 2 gymnast and been there for 2 months just becuase she cant do a round of backhandspring becuase she just sprained her arm. Wish I had found this when I was still doing gymnastics. I quit when I turned ten and would have been in level 8. I live in Australia though so the levels are different.